Day 7 found us at New Bo Ky, a restaurant with a fairly singular focus. New Bo Ky specializes in noodle soups. A lot of people go to New Bo Ky thinking it is a Vietnamese restaurant because the sign out front says PHO in big letters and. I believe it has some Vietnamese writing as well (I confess my ignorance). It is not. New Bo Ky is a Chinese restaurant, but it's offerings do touch ground in Vietnam. That focus pays off. New Bo Ky looks like your standard bare bones Chinatown restaurant. Chances are you will be seated at a large table with other customers. The clientele is heavily Chinese and most of the waiters have a minimum grasp of English. The service is brusque but very fast. Bo Ky offers soups with beef, pork, chicken and various other animal parts. For those who like kidneys, intestines and feet, Bo Ky has you covered as well. But since they specifically tout their seafood noodle soups on their store sign, that is the way we went. The best thing not soup related is their roast duck. Bo Ky calls it Country Duck. A little sweet and sharp with a vinegar bite. We devoured it. A winner. Great fish dumplings, wonderful seafood broth and excellent noodles. 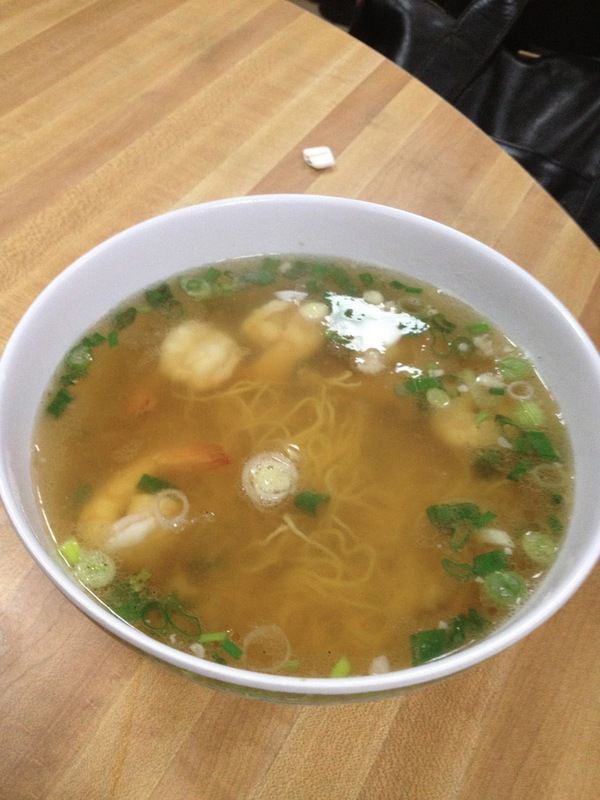 Another fine seafood noodle soup. Can't go wrong with either. Simple greens with a little sesame oil. Nice. One special note. In addition to all the usual condiments there are two containers of home made hot sauces on each table. One is a red sauce, similar to what you would find in a spicy wonton dish. The other is a green sauce, with green chilies that would not be out of place in a Mexican restaurant. Use them. They are amazing. In fact, when we paid the bill, the woman who gave us our check asked if we had tried them. We told her we had and loved them and she was very happy. It turns out, she makes them herself. Quick, easy and delicious, New Bo Ky brings the goods for all noodle soup fans. Oh, and one more thing. It is insanely cheap. That big bowl of Fish Dumpling soup? $4.75. Healthy food can be defined as those meals that are low in fat and also soaked fats. It is vital to note that if it is a single food that is being eaten. It has to be able to offer at least 10% of one or more. To begin with, healthy eating or food simply means eating different types of foods. That can give a person the nutrients that he or she needs to feel good and have the required energy. Good nutrition or food is quite vital for everyone regardless of age religion affiliation. If good food is combined with being active as well as keeping a healthy weight it would be good for the health. For those that may be having breast cancer or is now under medication for cancer, eating a balanced diet is really vital for those. What a personal eats can truly affect his or her immune system positively as well as boosting his or her mood and energy level. It is vital to note that no food or diet that can prevent one from developing the cancerous state. Although researchers are still studying the use of unhealthy foods on breast cancer as well as recurrence for the risk of breast cancer, there are few researchers that have shown that there are some groups of foods that can add to the risk for cancer. Healthy food is one of the mainly vital factors that play a clear and real role in human health. This plays a vital role in preserving health in common. Some nutrients stand for the main role in renewing the health of the body with its organs. Eat moderate amounts of foods and meet the body’s want for them. As well as avoid over-ingestion, because it works on exposure to human obesity, which in turn lead to exposure to diseases.